Hey Nor Cal mark your calendar! Cast Hopes annual fall fund raiser the BIG NIGHT OUT is coming up Sept 12 in Chico, CA at the Womens Center. Food Trucks (included in ticket price), Auction, Sierra Nevada Beer, and Live Muisc! Man …. I want to apologize for complete lack of posts…summer has been busy with guiding, traveling, and family. Not that that is any excuse as EVERYONE is busy I have just had a really hard time with everything going on to justify spending any more time then absolutely necessary in-front of a computer screen. I will carve out a few hours while watching the giants tonight and killing time in between some other tasks tomorrow to update the blog…here goes. 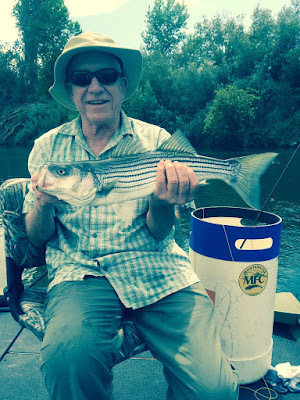 I have done very little trout fishing this summer spending almost all my time on the Lower Sac fishing for stripers. 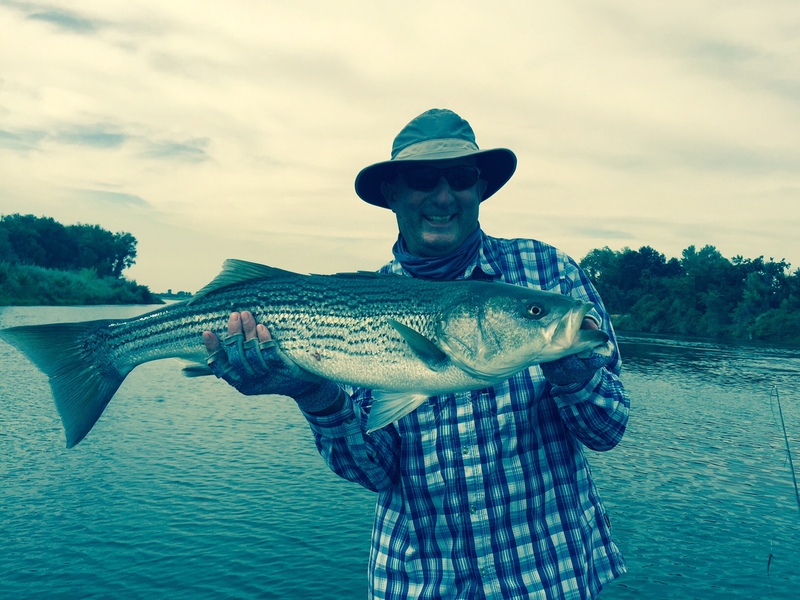 It has been an incredibly good striper year on the Lower Sac and really seems like it will last well into October this year. In June we saw good numbers of trophy fish some up to 50lbs. July saw the arrival of one of the latest and largest runs of shad I have seen in years. Huge schools of fish showed up eating dry flies and hanging up on the surface in the deeper pools. These fish have sense moved up river now and seem to be around Red Bluff. For about 3 weeks we worked our tails off to get a fish over 20” while we would catch huge numbers of 17-18” fish the bigger fish say over 5lbs was nearly impossible to come by. In the last 2 weeks the shad have moved on and the bigger fish are starting to show themselves. In the last few days we have had good numbers of fish from 6-10lbs and a few up to 20lbs. There are nearly no salmon to speak of from Butte City up to the Capay area so the river is nearly empty, but this also changes fishing as there are not salmon and boats to push the fish around. Fishing should continue to remain good through early October, August and September are going to be great months for big fish. I have only a few days open left through early October and am already taking bookings for next summer if anyone is interested. 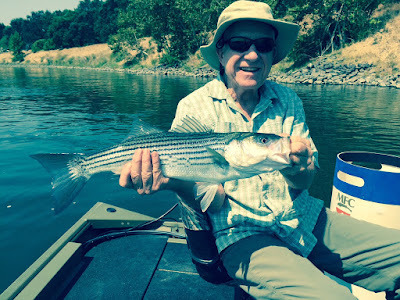 Printed Word – Check out the Current August issue of California Fly Fishermen and read my article (if you like fine literature and insight on fish it will change your life): The Other Lower Sacramento: Striper Fishing from Red Bluff to Butte City: The Sacramento River is about more than trout. There has been so much good new music over the last month. The Jason Isbell CD is great with typical awesome songs about life, work, and living…some sad, some insightful, and some just rocking. The new Wilco CD is growing on me…it was free so no money lost but I have had a tough time with the last two Wilco CD’s, just couldn’t get into them. My wife and I got out to see Built to Spill down in Sac in Late June at Harlows…so cool seeing one of my favorite bands up close and personal in such a small venue. I was right up front and it was a true treat to watch all 3 guitar players play. I have not bought their new CD but I am sure I will very soon ounce I need some new music. It is that time of year again where all the new gear comes out. Simms Fall 2016 line is now up on the Simms website and the biggest news is the NEW Pro Dry Suit, but the new wading jackets are also really cool. The Scott Meridian Rod won best of show overall at the ICAST show a few weeks ago. It is Scotts new high end salt rod replacing the S4S. I should have new 9wt Meridian in my boat very shortly for everyone to try. I have yet to see the new Montana Fly Co. line up for 2016 but I know the patterns of mine that will be coming out will be good and I expect nothing less from the rest of the crew. Giants are playing well, I have to say I have enjoyed the July into August Giants. I don’t feel like we are going to make a world series run but I think there will be some interesting September baseball. In the end all I ask for as a fan is that all the games mean something through the end of the season. A tough schedule for the month of August (no team under .500 on the schedule) will determine a whole log how September will look. Notre Dame…Getting ready for spring practice and opening with Texas. The QB controversy is over and now it is Zaires team…we will see how he does soon. Cast Hope has had an incredibly busy summer…along with our normal array of guide trips we have taken two groups through paces and travel to earn their heritage trout certificates, we have taken a group of Cast Hope veterans on their first “destination” trip to the Umpqua River for smallmouth bass fishing, we are in the middle of our salmon and steelhead project, we have run 2 bass clinics, run two fish fests, and are working on all our fall and winter fundraising as well as guide dates. BUSY BUSY BUSY…. 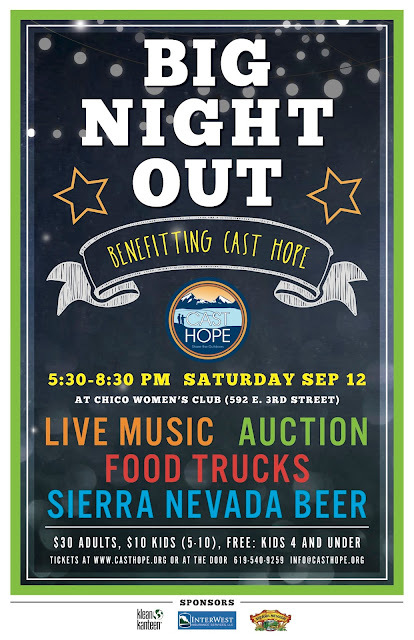 For our Chico people we have our “Big Night Out” coming up September 12. Going to be a great event for local nor cal people to come out celebrate what Cast Hope does, eat, drink, and have fun! Lots of great auction and raffle items as well as live music, beer, food trucks, and desert! I will post up some more information as it gets closer but in the mean time here if the flier.